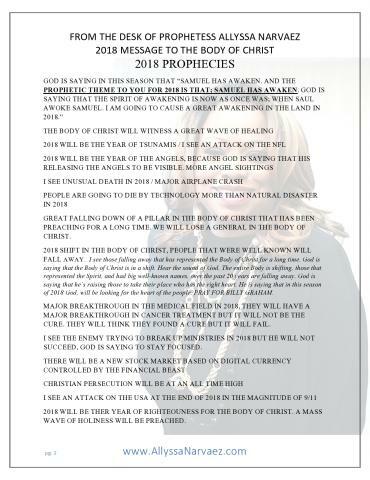 All prophecies are the expressive ministry of Allyssa Narvaez. No duplication or imitations allowed. PLEASE COPY AND PASTE CONFIRMATION LINKS INTO NEW WEB BROWSER. Jan.-This Will Be The Month Of Earthquakes Strongly for The 1st Quarter of The Year. Record Breaking Earthquakes, Bigger, Grander, Stronger. We are going to lose somebody in the Body of Christ. This Man of God has to die so that others can rise up. Feb.- People Are Going To Testify Against The White House. Apr.- April Will Be The Month of Supernatural Finances In The Body of Christ for PROJECTS. May-Month of Fire Storms. Lands Will burn and Lives Will Be Lost. July- Governments Will Come Together To Discuss Weapons Of Mass Destruction, Because A Terrorist Will Arise Like, Saddam Hussein, and Osama Bin Laden. Aug.-Signs of The Time, Bank In EK will Struggle. Aug. Will Be A Record- Breaking Hot Month... Many Will Die from The Heat. 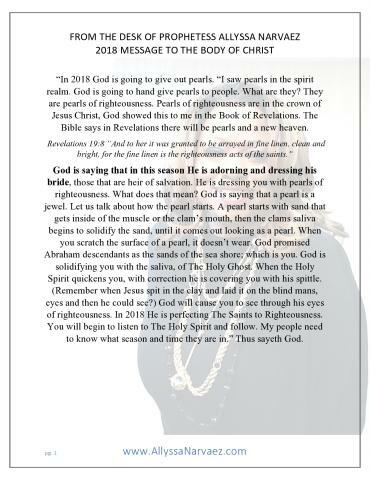 Sept.- I see A New King & Queen Arising In The UK. Pray for Queen Elizabeth. Oct.- End of the Financial challenge Will be over. Oct. Will be the month of the release because the finances will be released. Everything that people were challenged with in the months, of January until October, will begin to experience a release in the land. Nov.-Pray for Secular Artist is the month where I take a lot of great singers, they will not live to see 2020, for the month of November has been assigned to great singers in the world. General Message to The Body Of Christ: I hear the Spirit of God saying that airline tickets are going to go up like never seen before in 2019. 2019 is the year of the beast. I see the beast standing on airlines and finances. What we have to understand about the beast is that he is a financial beast, the enemy of finances. This is how the Body of Christ is going to fight against the enemy, because we have to have finances in the Body. God is saying that the enemy is going to attack the finances of the world. He is going to attack airline tickets. I hear the Spirit of God saying that in 2019 airline tickets are going to go up, for God is saying that the enemy is going to attack travel, because he is the prince of the power of the air. You thought he only had power inside of waves.